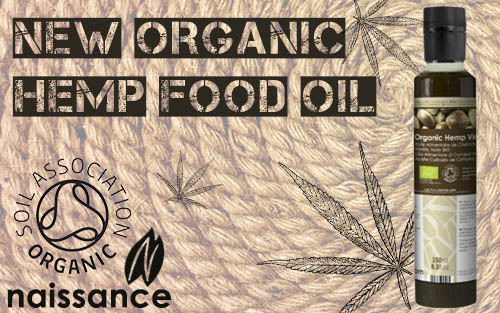 Our New Organic Hemp Food Oil is here - Could this be the superfood for 2016? Our New Organic Hemp Food Oil is here - Is this the latest ‘superfood’? Well we are impressed with it but we’ll let you be the judge. Naissance NEW Hemp Seed Food Oil is available now. Cold pressed, virgin, and certified by the Soil Association. This natural oil is a vegetarian, vegan and raw diet friendly health food. A delicious alternative to regular cooking and salad oils, its nutty flavour adds depth and can replace olive oil or walnut oil. You can even take it on its own and reap the benefits of this nutritious oil. Some people take Hemp Oil as a dietary supplement as part of a balanced diet. As Hemp Food Oil has a very low smoke point it is best not to cook it, or only lightly heat it as the oil will lose an amount of its nutrients during the heating process. Hemp Food Oil is thought to help with neurodermatitis, eczema and psoriasis because it is argued that it contains a good balance of fatty acids and omega 3,6 and 9 which can be lacking in certain people who suffer from these conditions. It has the recommended daily intake of essential fatty acids if three teaspoons are taken, daily, but this depends on your current diet. This includes Omega 3,6 and 9 and tocopherols (vitamin E). We love it, and we hope you do. Do tell us what your favourite food oil is. What have you found it’s best for? We would really like to hear about it. Standards - We all have them - The Soil Association does too, and they are very high. This is why we should be grateful for the work they do on our behalf.